Back in 1994 scientists discovered the Little Foot fossil, representing a 3.67 million year old branch of humanity1. Except it was encased in rock so tough that it took them until 2017 to actually get it out. But now they’re free, and we’re learning so much about them. One recent discovery is that they had a surprisingly small brain for their kind2. The Little Foot fossil belongs to Australopithecus, which is an older group of hominins. Being further back on the family tree, they share more similarities with other living apes than we do. However, one key difference is their brains; which tend to be ~20% larger than chimps’3. Unless your name is Little Foot, in which case your brain is only 10% bigger; clocking in at ~408 cc2. Normally, figuring out a species brain size can be done by just looking at the volume of the brain case. However, Little Foot is a little tricky. Although they may be out of the rock, they’re still full of it. The cranial cavity is just full of sediment2. Fortunately, this actually helps preserve the shape of the brain better. The sediment inside fills in all the nooks and crannies, revealing details as fine as the wrinkles and veins on the brain; once scanned into a computer with X-ray tomography. All of which reveals a brain with about half a pint of volume, one of the smalles found in an Australopithecus2. However, their face is a little mushed. This distortion might impact the calculations of brain size, so this figure might be a slight underestimate. Although even when this is taken into account, Little Foot would still have one of the smallest brains we’ve found in an Australopithecus2. 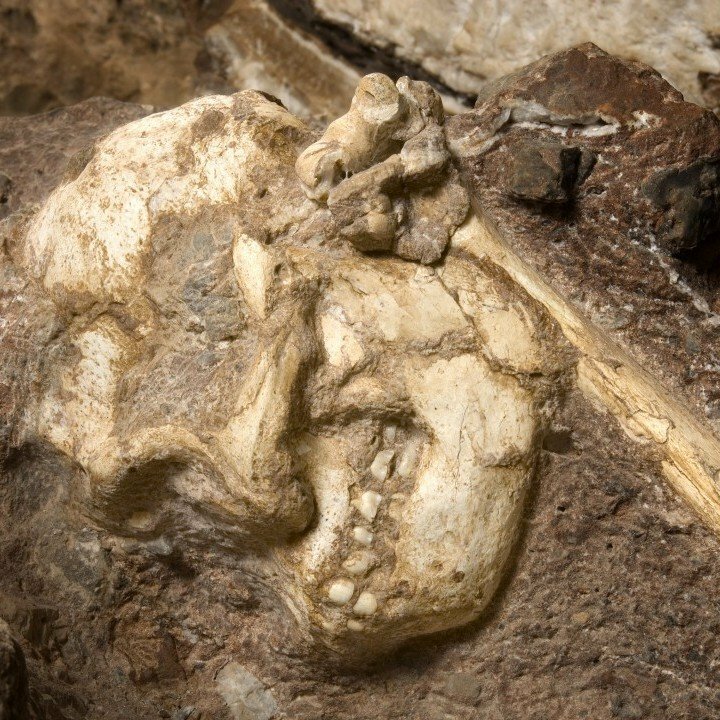 It turns out that not the small brain isn’t the only surprising thing about the Little Foot fossil. It’s also older than people thought. 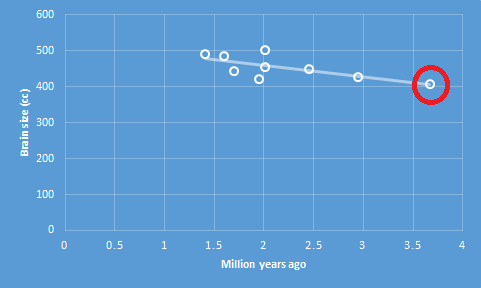 Early estimates suggested they lived ~2.2 milllion years ago; but they were actually alive closer to 4 mya. This makes them one of the oldest known members of Australopithecus, living around half a million years before the famous Lucy fossil1. Suddenly, their small brain starts to make sense. 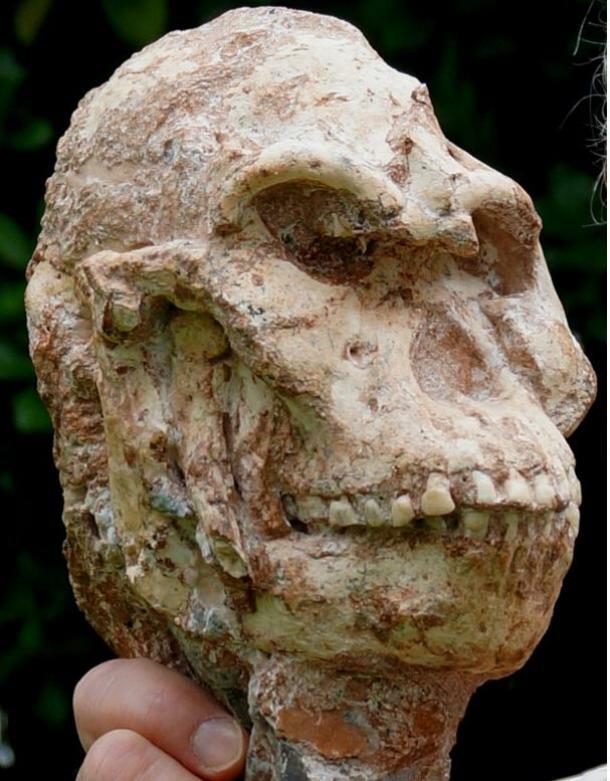 If later Australopithecus had evolved a big brain, obviously earlier examples would have a smaller one. That’s just how change works. Which might seem obvious, but was actually something we didn’t know was happening. Most Australopithecus species had a fairly similarly sized brain, making it difficult to tell if there was much change over time. However, with the data from Little Foot, we can now say it was. What’s more, a good chunk of this change happened quite early in the genus2. Mean brain size for various Australopithecus species, with Little Foot circled2. What does this mean for the little foot fossil? Thanks to the excellent preservation of their skull, researchers were able to look at the wrinkles on the brain. It turns out these are also more chimp-like than in younger species2. The scans of Little Foot’s brain, compared to some other species. Note all the visible wrinkles, handy for research2. All of this clearly reinforces the trend seen in brain size. We can confidently say that early Australopithecus had a more chimp-like brain, both in size and shape; but early in its history, it got bigger and moved more “human”. Whilst this does clear up some mysteries about our evolution, it also raises a few questions. What kicked off this brain evolution? Why does it mostly happen early on? How come it doesn’t keep going? It seems even out of the rock, the Little Foot fossil is leaving us with mysteries. SUBSOL, G., MORENO, B., JESSEL, J. P., BRAGA, J., BRUXELLES, L., THACKERAY, F., & CLARKE, R. (2015). In Situ 3D Digitization of the “Little Foot” Australopithecus Skeleton From Sterkfontein. PaleoAnthropology, 44, 53. Beaudet, A., Clarke, R.J., de Jager, E.J., Bruxelles, L., Carlson, K.J., Crompton, R., de Beer, F., Dhaene, J., Heaton, J.L., Jakata, K. and Jashashvili, T., 2019. 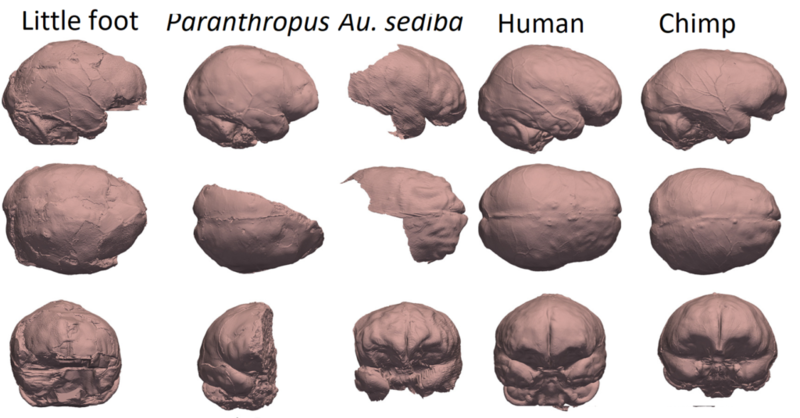 The endocast of StW 573 (“Little Foot”) and hominin brain evolution. Journal of human evolution, 126, pp.112-123. Grabowski, M., Voje, K.L. and Hansen, T.F., 2016. Evolutionary modeling and correcting for observation error support a 3/5 brain-body allometry for primates. Journal of Human Evolution, 94, pp.106-116. Next post: Why did prehistoric people make cave art?